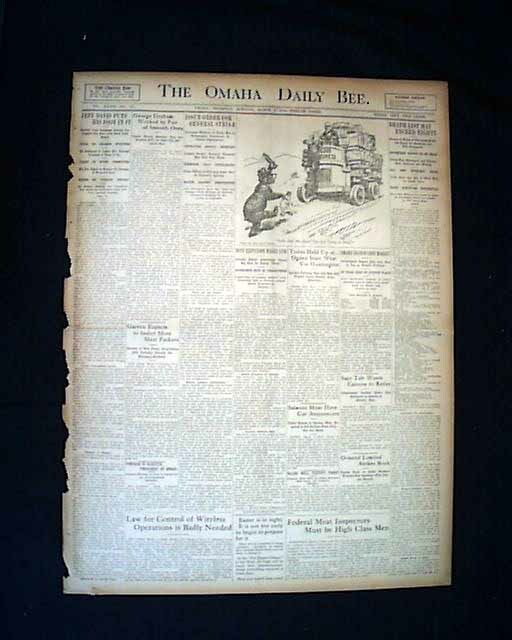 THE OMAHA DAILY BEE, Nebraska, March 3, 1910. 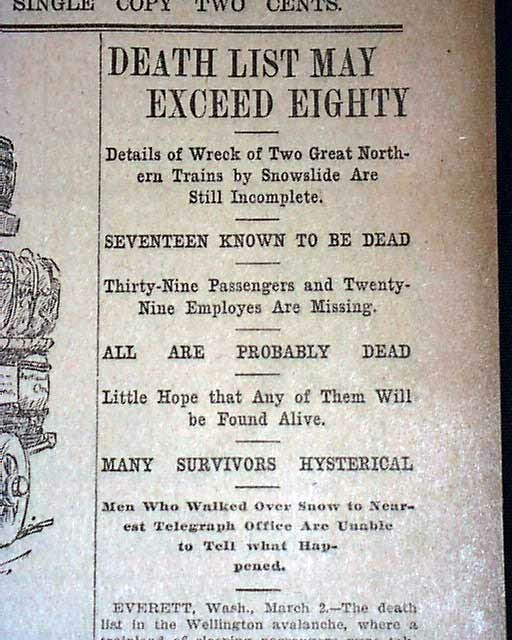 This 12 page newspaper has one column headlines on the front page that include: "DEATH LIST MAY EXCEED EIGHTY", "Details of Wreck of Two Northern Trains by Snowslide Are Still Incomplete", "Seventeen Known To Be Dead", "Thirty-Nine Passengers and Twenty-Nine Employees Are Missing", "Many Survivors Hysterical", and more. Other news of the day throughout. Somwhat browned with some margin wear especially at the spine. Somewhat pulpish, otherwise good. 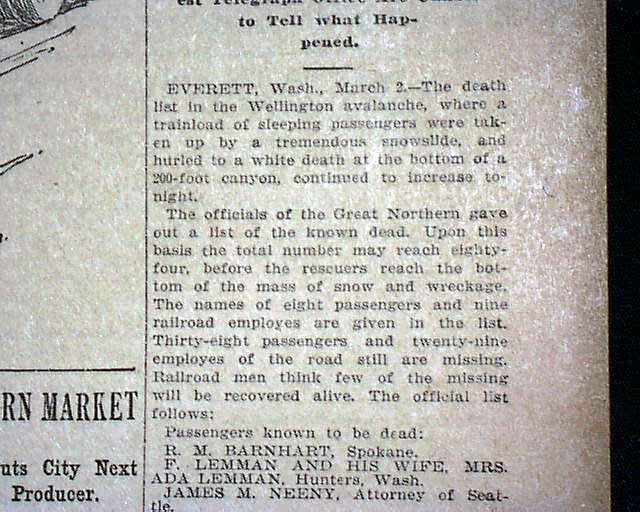 Background Information: The Wellington avalanche was the worst avalanche, measured in terms of lives lost, in the history of the United States. 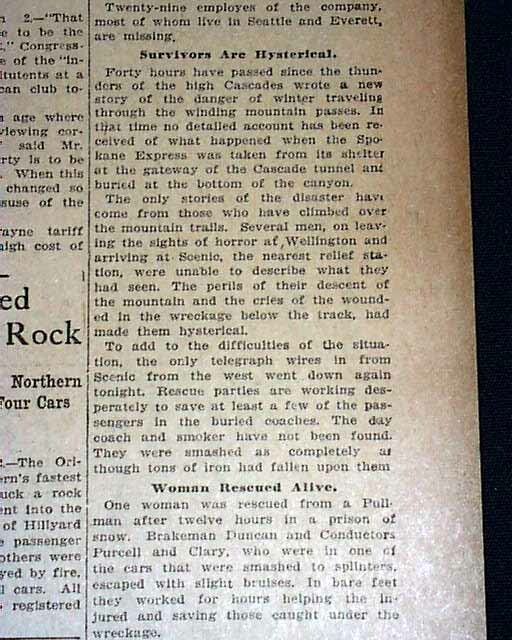 For nine days at the end of February 1910, the little town of Wellington, Washington, was assailed by a terrible blizzard. Wellington was a Great Northern Railway stop high in the Cascades, on the west side of the first Cascade Tunnel, under Stevens Pass. As much as a foot of snow fell every hour, and, on the worst day, eleven feet (335 cm) of snow fell. 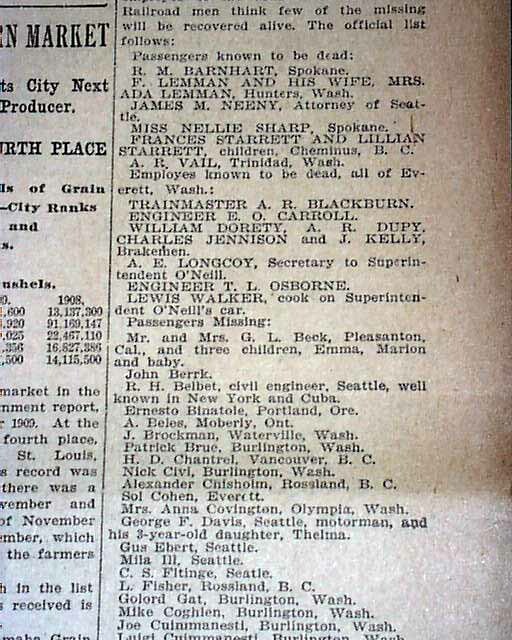 Two trains - a passenger train and a mail train, both bound from Spokane to Seattle - were trapped in the depot. Snow plows were present at Wellington and others were sent to help, but they could not penetrate the snow accumulations and repeated avalanches along the stretch of tracks between Scenic and Leavenworth. Late on February 28, the snow stopped and was replaced by rain and a warm wind. Just after 1 a.m. on March 1, a slab of snow broke loose from the side of Windy Mountain in the middle of a violent thunderstorm. A ten-foot wall of snow, half a mile long and a quarter of a mile wide, headed for the town. A massive forest fire had recently ravaged the slopes above the town, leaving very little to impede the avalanche. The avalanche missed the Bailets Hotel (which also housed the town's general store and post office), but hit the railroad depot. Most of the passengers and crew were asleep aboard their trains. The impact threw the trains 150 feet downhill and into the Tye River valley. 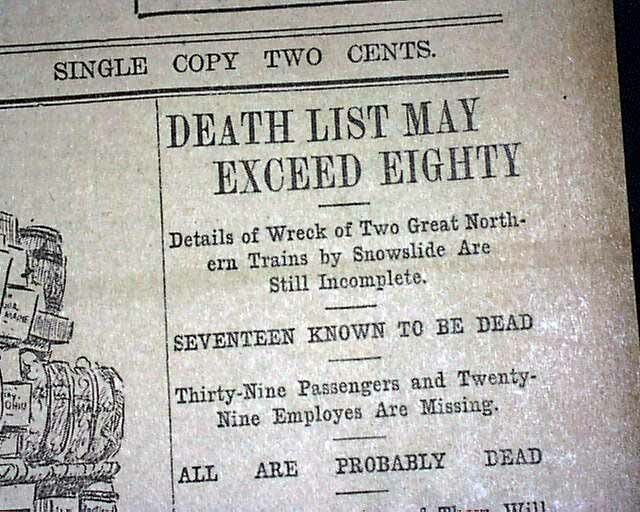 Ninety-six people were killed, of whom 35 were passengers, 58 were Great Northern employees on the trains, and three were railroad employees in the depot. Twenty-three passengers survived; they were pulled from the wreckage by railroad employees who immediately rushed from the hotel and other buildings where they had been staying. The work was soon abandoned, and not until 21 weeks later - in late July - was it possible to retrieve the last of the bodies.